What are you going on about Rita!!! I love your beautiful pink flower in the embossed frame. Love the dsp and ribbon and pearls too. I think you must just have a pink phobia or something. Must look that up and see if there is such a thing. I wish this was facebook and that I could "like" Kathy's comment. I totally agree with her, your card is gorgeous! That flower is stunning! 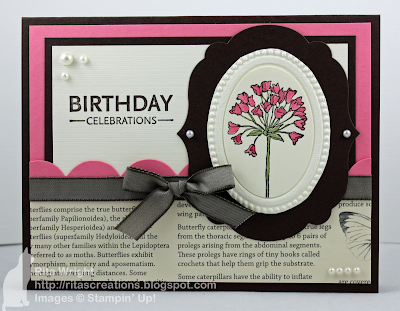 I despise pink also and gag everytime I use it but I have to agree with Kathy and Lesley, you rocked this card Rita! The flower is SOOO pretty and I think the rest of the elements came together wonderfully! Yep...you are definitely out-voted This is amazing! I knew when I saw it in the DT gallery that I was pinning it! I love that frame inside the frame. I'm not a pink girl either but the black grounds it beautifully. See above..........love it! The framing is terrific! This is gorgeous!!! love everything, the tiny pearls sets it off beautifully! I love the colors and the bow is just perfect! Your card is strikingly lovely! My first impression was that I wish I had all that new product to work with, too. I don't use regal rose much either, but it is so pretty hear with the black and newsprint. Nice! I think this is such a cool card, Rita! I am not usually a pink lover, but I LOVE the look of the Regal Rose on this card! Great job! What's not to like Rita? 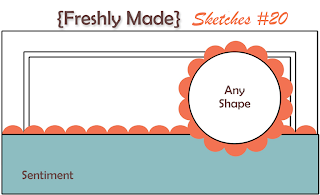 The colors are gorgeous, your coloring is perfect and the proportions are spot-on! I love it!! Ditto ... to everything above ... this is pure delight, and I love everything about it ... the PINK, and that gorgeous coloured flower within the embossed frame is just sheer brilliance ... well done Rita, this is awesome!!! I already told you but I like it:-) Especially the DSP! I need to dust off the rose! No idea when I used it last! Rita, I am soooooooo flattered that you took the time to comment on my blog! I love your work! Rita - this is breathtaking! I love the clean crisp look of your card and the color combination is superb. I never used Regal Rose until recently myself so I can understand your frustrations with that color. LOL But, seriously, this card is gorgeous! I love how you used the framelits with the decorative EF.